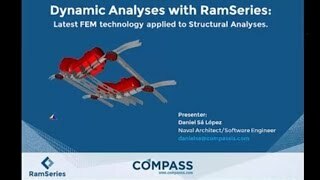 Second RamSeries Webinar: CompassIS latest FEM technology applied to Dynamic Analyses. RamSeries: CompassIS latest FEM technology applied to Dynamic Analyses. Among the features offered, RamSeries DYNSOL includes the latest technology for dynamic analysis of structures, offering different types of dynamic analyses including step-by-step direct integration, modal/vibration and seismic analysis. The module supports static and dynamic load definition, either by analytical functions or data tables, response spectra and several modes of damping definition. In this webinar, RamSeries DYNSOL module will be demonstrated through simple benchmark analyses involving: a cable net subjected to earthquake load, and the free flight of a flexible rod. This course is aimed at practising engineers who wish to learn more about how to apply finite element techniques to structural dynamic analyses in the most effective manner. The webinar will be followed by a Question & Answer session for an opportunity to have any question answered about the use and application of this advanced tool. 1.- Time: 08:00 AM - 08:30 AM CET. Register now. 2.- Time: 16:00 PM - 16:30 PM CET. Register now. - Short introduction to RamSeries: Technical Features and Capabilities. - RamSeries demonstration examples: Cable network analysis.